A group of Wabash students have remained on campus this summer to participate in the annual Summer Business Immersion Program. The students are part of an intense eight-week program that features speakers, case studies, and road trips to learn about entrepreneurship and all facets of business. Already the group has studied entrepreneurship, leadership, and studied various company profiles. They’ve taken site visits to 240 Sweet a confectionary in Columbus, IN., Triton Brewing Co. and the Engledow Group in Indianapolis. 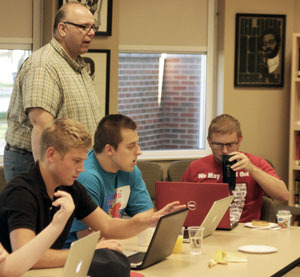 A number of Wabash graduates share time with the students making presentations on their personal business experiences. Graham Stewart '15 said the case studies and on-site visits are a great education. "We see what mistakes entrepreneurs have made, and what they have done correctly," he said. "We sharpen our business acumen by learning what a business plan is supposed to be like, how to market a business, how to pay employees for incentives, and how to lead a group and give group presentations. We apply all of this new information in our own business groups, where we have to plan out a business and give a pitch for it to a panel of alumni, much like, “Shark Tank.” The Business Immersion Program is very much like going to business school with a bunch of your friends." 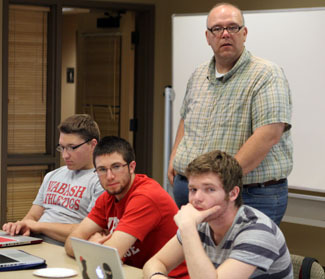 Even though the pace around campus is much slower than during the school year, Morin tries to maintain the rigor of the Wabash classroom. “I have set the expectations and deliverables very high,” said Morin, a partner at Innovate Consulting Group at Mishawaka. “Students are challenged to write four papers, produce a full business plan for a viable entrepreneurial idea and then present the plan to panel of business experts where they have to defend their reasoning and thought process. “They are also given a consulting project that requires a much broader range of thinking about a business topic. And along the way, they will make about 10 individual presentations in front of the class to help them work on their presentation skills. The students arrive engaged at 9 a.m. each day in part because of Morin’s enthusiasm. “Roland is an excellent instructor who knows business very well and has seemingly endless knowledge about marketing,” Patrick Carter ‘14 said. “I also feel like we have been really well taken care of by him and Betsy Knott as far as making sure we have what we need to succeed. The highlights so far have definitely been our site visits. Visiting businesses, especially ones that are owned by alumni, is really interesting. The different paths our alumni have taken to become successful in their respective fields are really diverse. The class meets daily through the week of July 2. The students make their final presentations July 5 and have a wrap-up session July 6.